New York (TADIAS) — The Ethiopian Community Mutual Assistance Association (ECMAA) has been hosting family-friendly events in New York City for many years including their popular annual Ethiopian Day picnic that is usually held in September. With ECMAA’s new Board of Directors — that includes more participation from young professionals — it is now expanding its outdoor programs to include community soccer games. 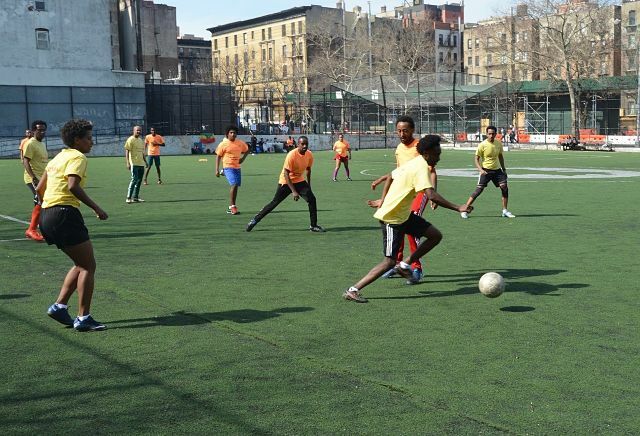 The first soccer game of the season took place this past weekend on the Upper West Side of Manhattan with teams sponsored by Awash restaurant in Manhattan and Bati Ethiopian Kitchen in Brooklyn. Technically the Awash team (yellow jerseys) represented those over 30 and Bati (orange jerseys) under 30. Awash won the match 11 to 8. “It was a lot of fun,” enthused Dinsiri Fikru, one of the organizers, during a dinner at Awash after the game. “We had a full team of 11 players each.” A rematch is scheduled for June 9, 2019. ECMAA was founded in 1981 to serve the New York, New Jersey and Connecticut Ethiopian Diaspora community. In addition to regularly hosting social, educational and networking events they also help “individuals to find ways to give back to their community by sharing their skills and experiences or by assisting financially.” Recently launched ECMAA programs also include weekend Amharic classes for children. You can learn more about ECMAA and contact the organizers at http://www.ecmaany.org.